The Heartstrings Fingerless Gloves make the perfect addition to the Heartstrings Ladies Slouch Hat I released a couple of weeks ago. The star stitch gives the illusion of cute little hearts running in rows up these stylish gloves. They are a perfect cool weather fashion accessory for just about any occasion. Repeat rows 2-5, 3 more times, and then work rows 2-4 once. You should see your pattern repeat a total of 5 times at the end. If you crochet with very tight tension, going up a hook size for this next section is recommended. Knot securely and cut yarn leaving a short 5″ tail for sewing up the lower seam of the glove. Sew up about 1/2″ to 3/4″ so that the band you just stitched sits right about knuckle level, and side part you sewed comes just up under your thumb. Fasten off securely. Attach yarn to other end of fingerless glove, leaving an 8″ tail for sewing the top seam of the glove together. With the tail, sew part way down the side (about 3/4″ to 1″), leaving about 7 or 8 stitches for your thumb hole. Fasten off the tail securely, then continue working this next section with the other end of the yarn (this way there are fewer ends to weave in ). If you want a longer top cuff, repeat round 3 another time or two. 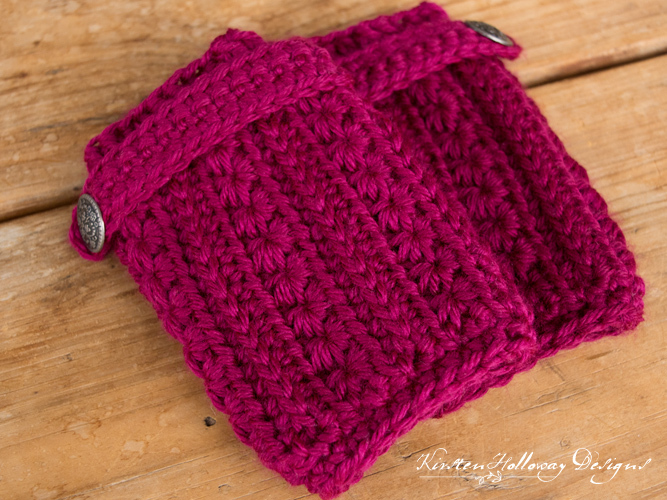 Slid the cuff over your hand to make sure it fits! Row 2: ch 1, turn, sc in each stitch across. When you get to the end of the row, turn the piece sideways and put 2 sc in the very end. Continue sc around the other side. Fasten off leaving a 5″ tail for sewing the button tab to the glove. Line the straight end of the button tab up with the thumb hole seam. Sew it securely to the glove, just below the top band. Put the glove on and lay the button tab across your wrist and see how it lays. Position the button near the side of your wrist, keeping an eye on the spot, then take the glove off and sew it on. The other glove will be made the same way, but the button tab will be sewn on the opposite side, so you don’t end up with two right hand or two left hand gloves. If you really want a thumb-hole instead of a slit, I’ll be including instructions on how to do that shortly. The thumb-hole will be a little bulkier than the slit. 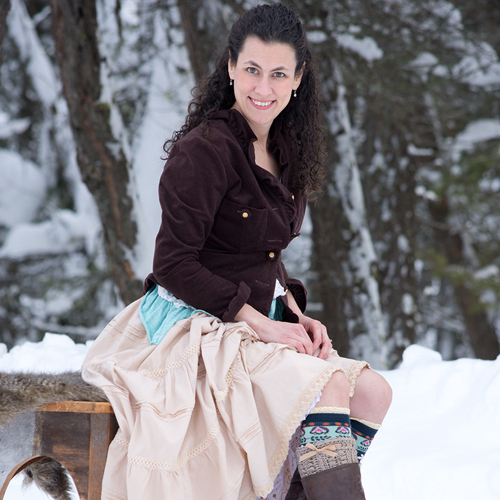 The Heartstrings Fingerless Gloves pattern was made to be used by individuals, and small business crocheters alike. Selling your finished pieces in boutiques, at farmer’s markets, craft shows and other events is encouraged! The only thing I require is that it not be used commercially to produce millions of copies. I haven’t gotten a thumbhole written up yet. You should be able to slip stitch around the bottom of the hole, then single crochet around the top part and repeat it around a few times unail its as long as your want. That way the bottom of the thumbhole isn’t as thick as the top. I hope that helps! I’m starting the finger band but it looks wrong – should the right side or the wrong side be facing you? The right side of the piece needs to be facing out before you start working the band. Both top and bottom bands are worked with the right side (patterned side) showing. I hope that helps! Thank you – that means I must have gone wrong somewhere, better count my rows !! I just dont understand what youre doing. Can you show pics or a video? Love how these turn out but the beginning chain count is off. If you hdc in the 3rd chain from the hook you only have 15 stitches . 🙂 Thanks so much for sharing the pattern! Hi Lori, I’m glad you liked them! The 2 skipped chains count as the first hdc of the beginning row (don’t forget to work the final stitch of the next row into the top of that chain!). Many of my patterns that use hdc on the first row also do this. I’m sorry for the confusion, but I hope that helps to clarify!